Our lab in the Osmond Laboratory building consists of 1800 square feet of space in three adjoining rooms which includes four fume hoods. 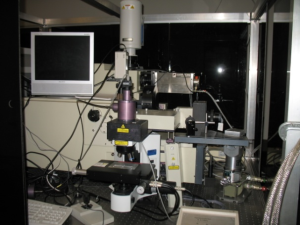 This space is equipped for nanomaterial and thin film preparation, fundamental materials characterization, and physical properties measurements as described briefly below. Turn-key, computer-controlled high vacuum deposition apparatus (K.J. Lesker model PVD 75) with thermal and e-beam evaporation sources, film thickness monitor, shutters and large capacity turbo-pump. Seven CVD systems equipped with gas pressure and mass-flow controllers. Among them, there are four ultrasonic sprayer systems, to perform aerosol assisted CVD (AA-CVD) experiments, with the capability of using one or two furnaces (up to 1100 ºC) and with quartz tube reactors. There are also two three three-zone furnaces with quartz tube reactors under vacuum, equipped with low pressure regulators. Finally, there is an ambient pressure CVD with a three zone furnace that reaches up to 1100 ºC with the capability of introducing water vapor, among other organic vapors during the reactions. Including one ball mill, ultrasonic horns and baths, centrifuge (14000 rpm) for separation of nanoparticles and wires by size, cross flow filtration separation of nanophase materials by size and shape (KrosFlo, SpectrumLabs.com), turbo-pumped vacuum annealing station 1200 ºC, high temperature furnace (up to 1700 ºC) for annealing and high-T CVD or PLV growth processes, argon atmosphere glove-box (Vacuum atmospheres) with controlled environment for air-sensitive chemicals/sample preparation, two micro-balances, spin-coater system (Chemat Technology, KW-4A), 10 ton hot press to produce ceramic pellets and ablation targets. 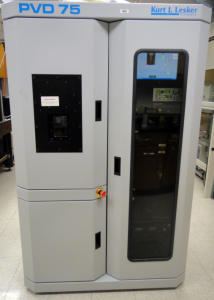 attachment; low temperature cryostat 4-400 K.
UV-Vis-NIR grating instrument for transmission, variable angle reflectance, diffuse reflectance (Perkin Elmer Lambda 950). 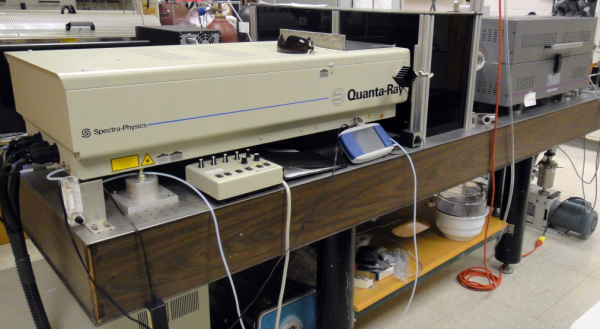 Triple grating Micro/Macro Raman spectrometer (Jobin Yvon model T64000) for photoluminescence and Raman scattering; very high stray light rejection, additive or substractive modes; and L-N2 cooled CCD camera. Laser excitation from near IR to UV. 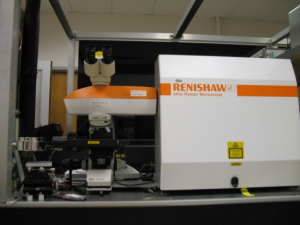 Renishaw INVia with thermoelectric CCD, for photoluminescence or Raman or Rayleigh scattering near-IR to UV. This unit includes a low temperature cryostat that allows experiments in controlled atmospheres and simultaneous electrical measurements.Wavelengths: Ar laser currently using UV (364 nm) (but it has all the typical lines for Ar lasers). Ar/Kr laser used for visible lines, including: 647 nm, 528 nm, 514 nm, 496.5 nm, 488 nm y 476.5 nm. Solid state laser NIR, 785nm. Electrical Resistivity and Thermoelectric Power 4-600 K, home-built system with vacuum-gas handling chamber for chemical sensor research. Potentiostat/Galvanostat VERSASTAT4-400 from Princeton Applied Research. Professor Terrones shares a laboratory with Professor Joshua Robinson and Professor Nasim Alem that focuses on advanced materials and device development based on graphene, graphene oxide, boron nitride, and transistion metal dichalcogenides. With a total of ~1,200 sq. ft., our lab is a vertically integrated laboratory within the Penn State Materials Research Institute capable of synthesis, heterogeneous integration, advanced materials characterization, and device fabrication and evaluation.